PROVIDENCE, R.I. - The Providence College women's hockey team dropped a Hockey East contest to the Boston College Eagles, 4-2, on Saturday, Jan. 26 at Schneider Arena. 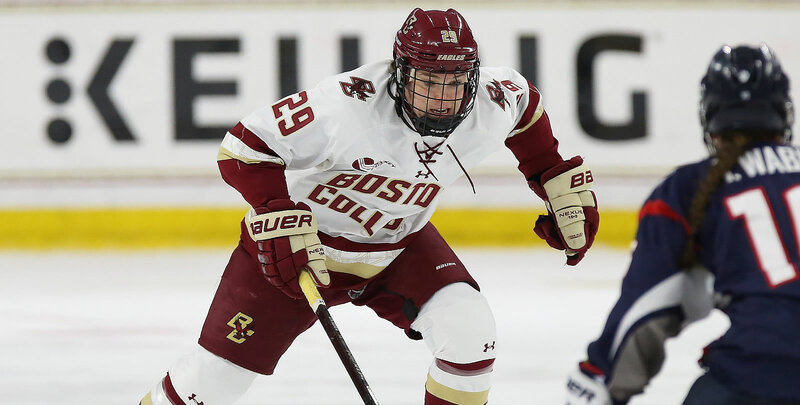 - Boston College struck early and first for the second time this weekend. Daryl Watts played the puck to the low slot where Makenna Newkirk was able to roof a shot over the shoulder of Madison Myers (Colchester, Vt.) just 45 seconds into action. - The Friars' best chance of the opening period came late, as Maureen Murphy (Buffalo, N.Y.) and Hayley Lunny (Bedford, N.Y.) skated in on a 2-on-1. Lunny took the initial shot and Murphy had a rebound bid, but both were denied by Maddy MacArthur. - The Eagles extended the lead to 2-0 just 2:26 into the second. Lindsey Agnew scored on a back-door feed from Watts. Keller picked up her second assist of the game on the play. - Providence got its first power-play opportunity of the game late in the period. Lunny scored her eighth goal of the season for the Friars 15 seconds into the man-advantage. Cassidy MacPherson (Oakville, Ontario) played the puck cross-ice to Whitney Dove (Port Moody, British Columbia). She fired a shot that Lunny tipped past MacArthur to make it 2-1. - Sara Hjalmarsson (Bankeryd, Sweden) tied the game about two minutes later with another power play goal. Murphy took a slap shot from the point that hit a defenseman in front. Hjalmarsson corralled the loose puck and buried it for her eighth goal of the season. - MacPherson earned her second assist of the game, and ninth of the season, on the play. - Providence had another power play early in the third, but this time it was BC that capitalized. Lindsay Agnew scored her second of the game on a short-handed rush. Newkirk assisted the play. - The Eagles pushed the lead back to two goals at the 5:08 mark of the third. Caitrin Lonergan scored from the top of the crease off a nice set-up by Kelly Browne and Kali Flanagan. - Myers finished with 27 saves for Providence and MacArthur made 22 for BC. - The Eagles won the regular-season series between the teams with a record of 2-1-0. Providence plays at Merrimack next Friday (Feb. 1) at 5:00 p.m. The Friars then host UConn on Saturday, Feb. 2 at 2:00 p.m. for the annual Skating Strides game.